Offering you a complete choice of products which include side mounted magnetic level and indicator, side mounted magnetic level indicator, float and board level indicator, reflex level indicator and tubular level indicator. 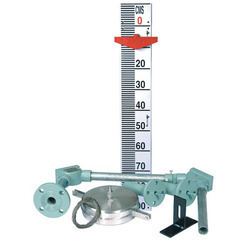 Magnetic Level Gauge Indicator suitable for large non- pressurized liquid storage tanks/vessels. The Specific Gravity of the fluid should be more than 0.6. The float is available in different material S.S.304/S.S.316/P.P./Teflon etc. 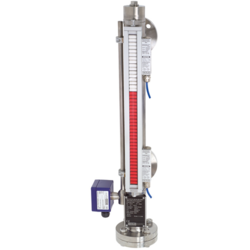 In this level gauge, the float designs as per the specific gravity of the liquid, floating on the liquid levels. This float connected to a pointer through Rope via a Sets of Pulleys, The pointer slides over a CM marked Board, Installed Parallel to the tank. For more than 3 meter height of the tank, we provide two guide wires firmly anchored to the tank bottom. So that horizontal movement of the float is restricted. Side Mounted Magnetic Level Indicator works simple magnetic principle used to get unique, most reliable & absolutely safe level indicator. It is mainly under used for most dangerous liquids even with under high pressure & high temperature. The unit consists of all SS 316 parts. With inside of SS main chamber pipe, the SS magnetic float which moves up & down. Accordingly follows liquid variation in the tank. The Float Magnet is operated by magnetically coupled to the Bicolour red & white outside chamber, which is mounted on front side of the main S.S. pipe. Fostered with massive industrial understanding and competence in this arena, we are engrossed in the realm of delivering to our customers a comprehensive collection of Reflex Level Indicator. 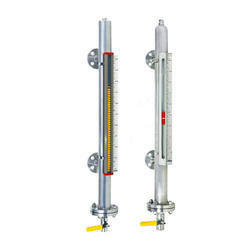 Tubular Level Gauge for visual liquid level observation is very common in process industry. It is a simple and reliable device for direct reading in atmospheric or pressurized tank applications. It is mounted parallel, along the side of tank. As the process level fluctuates, the level in the transparent glass tube changes accordingly and gives local liquid indication.This is a very simple instrument. It is flange mounted to the tank. As the liquid level rises in the tank, the liquid also rises inside the glass tube and one can see the liquid level in the tank. In this model the glass tube is enclosed in an enclosure which also carries a graduated scale. The liquid level in the gauge can be conveniently read against this scale.